I appreciate being treated like an adult. An author who writes a book for adults, I appreciate that. I don’t need her holding my hand as I read, explaining everything to me along the way. And I don’t need a story wrapped up for me in a nice, neat little package. I can deal with ambiguity. I'm an adult, more or less. “The new normal.” Given the nature of my research—in my other life, the one where I get paid, barely—I read a lot about the War on Terror. This trite expression, “the new normal"—and its even more reprehensible cousin, “Nine-eleven changed everything”—signaled the depths of the changes the world was undergoing, supposedly. Threat levels, chatter, gut-thinking: as in most things, the experts who assured us of this new normal were wrong. The Bush Years, with its alternating hysteria and militarism, was a moment in history ushering in, rather haphazardly, something far more nefarious, the Obama Administration. This is the new normal. No menacing plots, no color coded threat levels. The terrorist is no longer the garish, omnipresent fiend intent on destroying us. He simply is. The new normal is not hysteria following every vague threat, but rather a constant reality, one that hardly merits attention. The War on Terror, no longer named as such, as finally come into its own. I’ll just come out and write it: I really liked The Revisionists. A deeply political novel with very little politicking, the book is critical without preaching, a commentary on the War on Terror, driven nevertheless by an actual plot. Zed is an agent with the Department of Historical Integrity. His job is simple: He must ensure that the tragedy of history remains tragic—that atrocities, massacres, genocides happen the way they’re supposed to happen. Otherwise, the “Perfect Present” that is the distant future will not be. "Hags," archaic and anachronistic agents driven by the old superstitions—religion, nation, race—threaten the Perfect Present through their time-travelling revisionism. i.e. killing Hitler so there’s no Holocaust. Zed is sent to today’s Washington D.C. to ensure that something called “the Great Conflagration” occurs as it is supposed to occur. 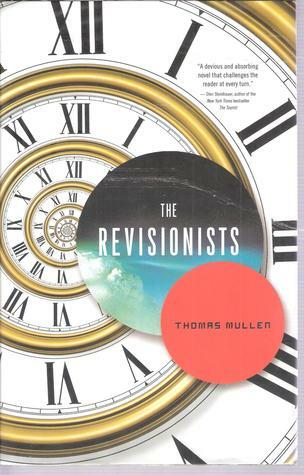 In The Revisionists, Thomas Mullen weaves this sci-fi-esque plot into a more grounded—and perhaps more familiar, though maybe not—reality of government spying, a persistent “war” lurking somewhere just out of sight, a war fought by misguided youth and mercenary contractors. Caught up in Zed’s mission is Tasha, a lawyer haunted by her own compromises and the death of her soldier brother; Leo, a former CIA agent whose frontline assignment against terrorism taught him quite a bit, but not enough; and Sari, a young Indonesian girl “working for”—or rather enslaved by—a Korean diplomat and his deeply damaged wife. First off, the book is a good read. I usually begin tuning out from a book around page 230. I didn’t start flipping forward to see how many pages remained until 370—with only 65 pages ahead of me. This, perhaps more than anything, is all that matters in terms of a review. Mullen deserves some points for one thing in particular: his nonwhite cast of characters. Only Leo is white. But this never feels like an afterthought, akin to their style of dress or taste in music. Rather, the characters’ ethnicity is used as a means for commenting on our racial obsessions and paranoia—particular when Zed encounters white people whose whiteness is always surprising. Like the book’s commentary on terrorism, security, privacy, etc., Mullen’s explorations into race are never inorganic, never preachy. And, more importantly, commentary never holds up the plot. The book doesn’t really end, not in a way that will satisfy our penchant for formula, for “resolution” of which the real world appears to be in short supply. Mullen treats his readers like adults who live in that real world, who can handle ambiguity, for whom walking away from a novel with questions isn’t a bad thing, but an indication of a good work of art. I’m not really sure how the book ended, and I am entirely unsure whether some of the characters are who they claimed to be, or perhaps believed themselves to be. And that’s a very, very good thing. There’s more, but I have dinner plans. Read the book. You’ll feel like you learned something. What it is, I’m not entirely sure.